Keeping a safe distance between you and other road users to your right and left is part of maintaining a "space cushion" around your car. If you have to brake or swerve suddenly, this space to the side gives you some room to move. This may be enough to avoid a collision with other road users if a hazard arises. Try to keep at least a metre between your vehicle and other moving or parked vehicles. This is important when driving beside parked cars because someone might open a car door in front of you. 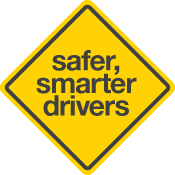 It is also important when passing or overtaking other vehicles and when other vehicles travelling in the opposite direction pass you on narrow roads. A space cushion to the left and right of your car also allows other vulnerable road users such as cyclists some room to move. This reduces the chances of colliding with them. It is best not to travel next to other vehicles even on a multi-laned road unless you have to. With a vehicle to your left and right as shown in the picture below, you have no room to swerve right or left should a hazard arise in front of you. So try to keep some space in the lane beside you so that you have a chance to steer around a hazard rather than be forced to brake hard. The following picture also shows that having vehicles to your right or left (or both) also blocks your vision. This may prevent you from seeing a hazard to the left or right (eg a car entering from a side road). It will be harder to avoid travelling next to other vehicles on multi-laned roads or freeways when the traffic is heavy. In these circumstances, however, the traffic is usually travelling more slowly, so braking is often easier. Keep at least a one metre "space cushion" between you and vehicles on your left or right. Avoid travelling next to other vehicles, particularly trucks and buses.